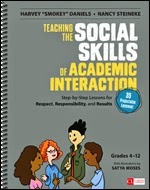 Join Harvey “Smokey” Daniels and Nancy Steineke, authors of Teaching the Social Skills of Academic Interaction for a free webinar on teaching students the language and behaviors of getting along. The added bonus? You’ll score better on classroom-engagement rubrics! Today's standards and classroom-engagement rubrics call for highly interactive classrooms where students work regularly and effectively with various peer partners and groups. But kids aren't born knowing how to collaborate with others; the social skills of academic interaction need to be explicitly taught. In this webinar, collaboration gurus Harvey "Smokey " Daniels and Nancy Steineke share the highlights of a systematic, yearlong program that introduces, models, builds, and reinforces collaborative classroom behavior, using curricular topics, not decontextualized exercises, as its focus.